Shaping a bed is an art. The shape of your beds contributes to the overall appearance of the garden. You can shape beds to create a feeling, contribute to your privacy, or lead people through the garden. Traditionally the vegetable garden and fruit orchard had a linear appearance – hills and furrows or rectangular wide beds for veggies and a grid layout for the orchard. Curvilinear beds were left to the ornamentals. Not so anymore. Edible landscaping has brought fruits and vegetables into the ornamental landscape. Whatever you decide to grow in your beds, shaping should be part of your planning and preparation. To create an artful bed, the gardener has to think in three dimensions, width, length, and height. They also must consider geometry. There are as many choices of shape as there are gardens and gardeners. There are two stages of shaping. The first is the initial layout of the bed. The second is shaping the contour of the soil after filling with bed mix or completing soil prep. This is the footprint, or outline of the bed before turf is removed and the soil is prepared. Stakes and strings can be used to layout square, rectangular, or circular beds. 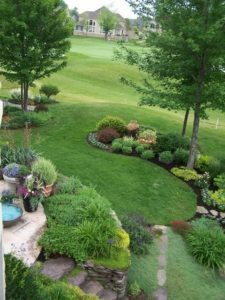 A curvilinear bed is easiest to lay out using a long, flexible rope or an old garden hose. You can rearrange the rope or hose to your hearts delight. Make sure to walk around and look at the bed from all angles including the street angle to make sure it is pleasing from every vantage point. After the perimeter is established, it is easiest to mark the outline with landscape paint. This is a spray paint in a can that is designed to work upside down. It comes in bright, easy to see neon colors that will wash off with the first rain. You can find landscape marking paint at most home improvement stores. Contouring is the third dimension – height. Beds do not have to be flat, level, or even all one height. There can be high spots and low spots, berms and swales. Contouring can be done with the design in mind, or to suit the needs of the plants, particularly as to drainage. It is done after the soil prep is complete but can be done before or after the border is installed. If the bed has been built by filling with bed mix, contouring can begin with the fill, applying more in the desired high spots, less in the desired low spots. The easiest way to complete contouring is with an iron rake. A lot of soil can be moved with this tool, and it is wide enough to be used to tamp as you go. After you have completed contouring, it is best to water the bed thoroughly and allow the soil to settle. This will allow you to address an areas that settle more than you expect before planting and mulching.